This is one of my favorite new recipes! Poutine is a Canadian favorite, traditionally made with a beef gravy, fresh cheese curds, and crispy fries. There are a million variations, and lots of restaurants are getting creative in the ways they present their variations on the classic, but the world was begging for this one. In southern California, taco shops and Mexican restaurants offers its own fast-food delicacy that many outside of the region haven’t heard of (or considered making) before: carne asada fries. 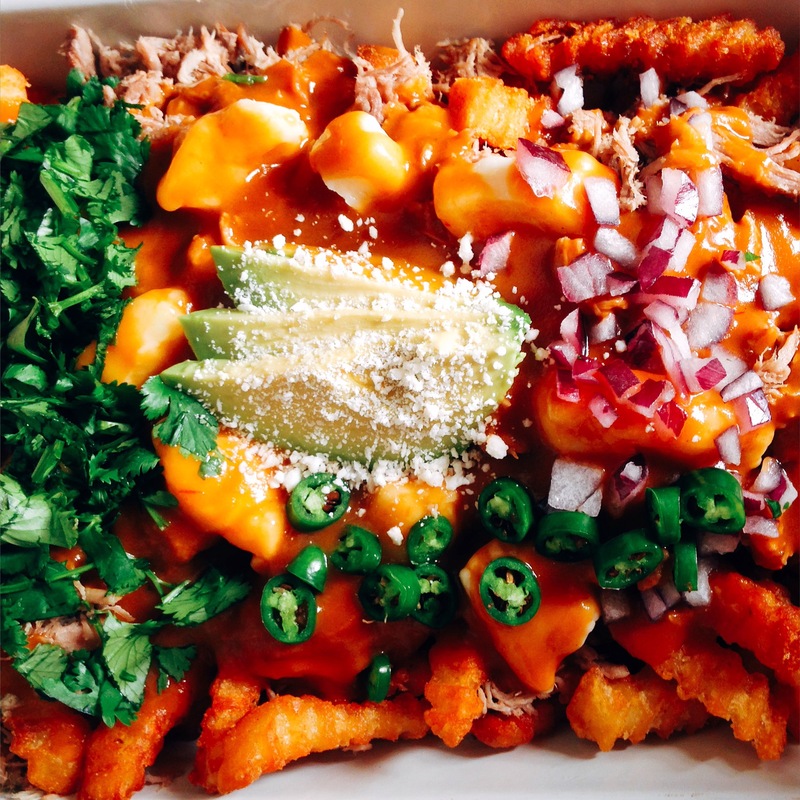 It’s basically a pile of meaty, cheesy, gooey nachos … only with fries instead of tortilla chips. Of course, you can get them with any meat on top, but the key is the super-crispy fries, the melted cheese, and the garnishes of avocado (or guacamole), cilantro, onion and jalapeno. This recipe is sort of a blend of the two: I use fresh cheese curds (check the deli/specialty cheese section of your market), a spicy gravy made with salsa chipotle, and Del Real Foods carnitas. 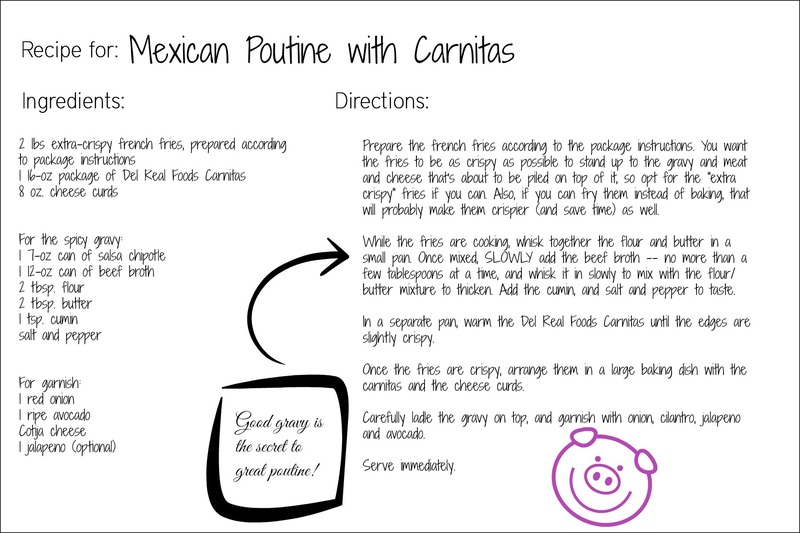 Since the carnitas only need to be warmed up and the cheese curds are fresh, you can easily make the gravy and fries, and assemble this amazing treat, in 30 minutes or less. This is my second entry in this year’s Del Real Foods Food Blogger contest, and I think it’s a winner! Prepare the french fries according to the package instructions. You want the fries to be as crispy as possible to stand up to the gravy and meat and cheese that’s about to be piled on top of it, so opt for the “extra crispy” fries if you can. Also, if you can fry them instead of baking, that will probably make them crispier (and save time) as well. While the fries are cooking, whisk together the flour and butter in a small pan. Once mixed, SLOWLY add the beef broth — no more than a few tablespoons at a time, and whisk it in slowly to mix with the flour/butter mixture to thicken. Add the can of salsa chipotle, then the cumin, and salt and pepper to taste. 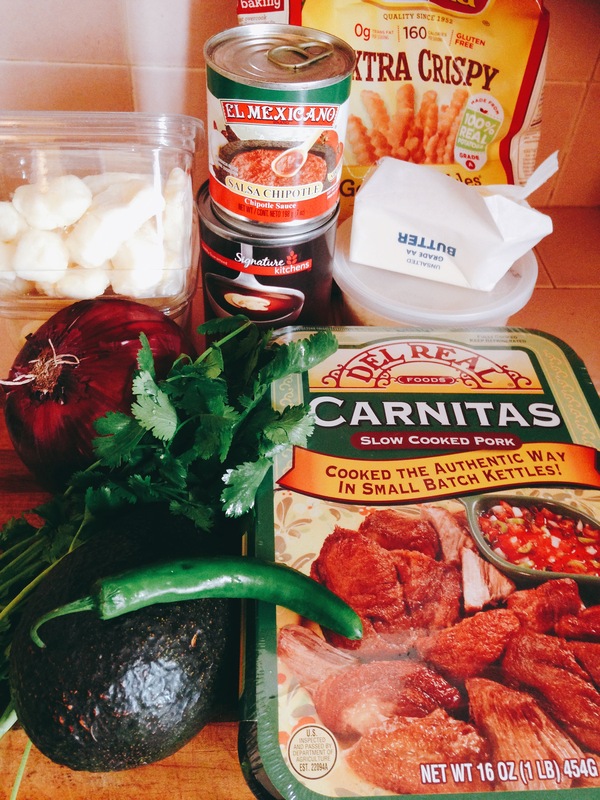 In a separate pan, warm the Del Real Foods Carnitas until the edges are slightly crispy. 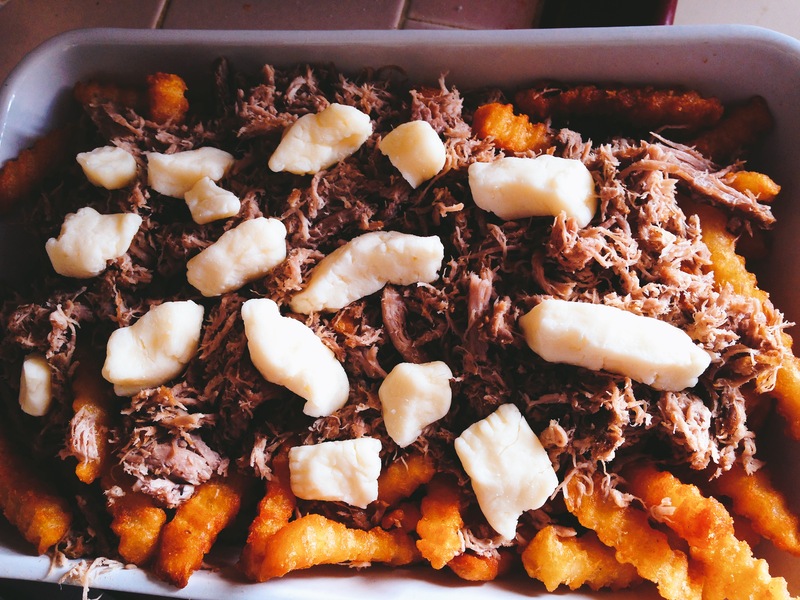 Once the fries are crispy, arrange them in a large baking dish with the carnitas and the cheese curds. Carefully ladle the gravy on top, and garnish with onion, cilantro, jalapeno and avocado. Save or Pin the recipe card to use later! This entry was posted in contests, cooking, Del Real Foods, food, holidays, Mexican food, snacks, sponsored posts, Uncategorized and tagged Canadian food, carnitas, cheese curds, Del Real Foods, Del Real Foods Recipe Challenge 2016, fries, Mexican food, mexican poutine, poutine, pre-cooked carnitas. Bookmark the permalink.